Finding that perfect venue to host your wedding requires you to spend time on researching what you need and what the venue offers. The multiple wedding venues in Mumbai may slightly add to you confusion. It's crucial consider the capacity, costing and other benefits which include the catering and décor. We have listed below some of the best wedding venues located in the city of Mumbai. Closed spaces make a great choice to host weddings in Mumbai as the weather keeps changing and there might be a surprise rainfall while you say your vows! So, most people prefer banquet halls for organising their weddings ceremonies. Located in Worli, facing the sea, this wedding venue has one of the finest banquet halls in Mumbai. Their beautiful halls come along with the finest catering services and an efficient staff that is always ready to guide you and the guests. They provide the best banqueting and dining facilities with theme-based décor, which is ideal to host your wedding reception, mehndi, sangeet or cocktail party. With a medium-sized banquet hall, they offer a complimentary changing room for the couple. Rental: Food & Beverage prices are inclusive of rental charges. If an elegant wedding reception is what you wish for, then the Athena Banquets in Powai is the best option. The venue has a medium-sized banquet hall and is ideal to plan a lavish wedding reception or a grand sangeet and mehndi function. It offers décor services and has an efficient team of in-house decorators who will adorn the venue as you want. With all this, they also provide two AC green rooms free of cost! Mayfair has a luxurious banquet hall that is just perfect to host a lavish wedding reception. Situated in the high profile area of Worli, this Banquet is a wonderful choice to organize your wedding functions in Mumbai. It serves some of the best cuisines and is backed by an efficient catering staff that will assist you and the guests whenever required. It has a North Banquet Hall, South Banquet Hall, a Lounge and Odyssey. These halls have different capacities and can also be clubbed if you wish to host a grand affair. Lawns are excellent to host weddings during the winter season. With the lush greenery or a close to nature feel, it also adds to the beauty of the wedding. Perfect for all both lavish and intimate weddings, the lawns accommodate comparatively a large number of guests. Being one of the biggest lawns in Mumbai, Cooperage Grounds is the best venue to host your wedding day. It has two spacious lawns with varied capacities and a hall combined with lawn to choose from. The venue offers luxurious cuisines that are served by Blue Sea of Grand Cuisines. 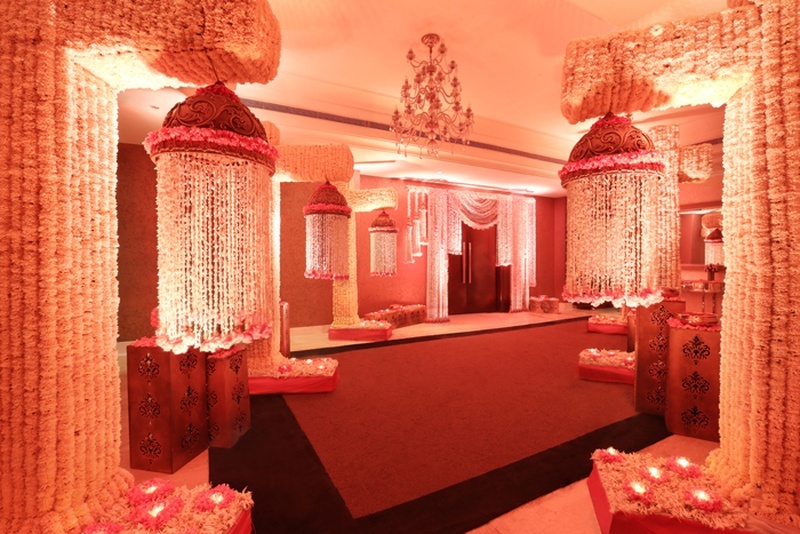 It has an in-house décor empaneled with them, who will take care of all the decorations for your special day. Rental: South Lawn is priced at Rs. 3, 53,000 for half day and East Lawn is priced at Rs. 2, 14,000 for half day. India’s first beach facing hotel, Sun-n-Sand is situated in Mumbai. It has two outdoor venues with varying capacities to choose from. Ideal to host a wedding reception, the party areas are great for hosting grand weddings. Moreover, it serves delicious cuisines and is backed by an efficient staff. They have empaneled National Décor as their in-house decorator, so you can be rest assured of the décor on your big day. What else? They even provide a green room and an overnight room for the couple absolutely free! The Club in Andheri offers high class and professional services for weddings. It has two lawns of varying capacities to choose from. Its Colonial Courtyard is ideal for a grand wedding reception; whereas, the Garden View is perfect for smaller functions. It has in-house catering services and serves delicious cuisines. Though they have an in-house decorator empaneled with them, they still allow you to bring your own decorator and adorn the space the way you want. This gorgeous wedding venue provides two AC rooms for the bride and groom on a complimentary basis. Hotels are sought-after to host wedding functions in Mumbai. These hotels accommodate all your needs and include banquet halls, lawns, terrace or poolside. So, we decided to give you a list of hotels famous for weddings. Here we go. Want your wedding to be remembered for a lifetime? Host it in Mumbai’s prominent Sahara Star. The gorgeous hotel has multiple party areas where you can organize your wedding functions. Its Sapphire Banquet Hall is a wonderful choice if you wish to have a grand wedding reception that will be attended by a long list of guests. The Jade Ballroom is the perfect space if you want your function to look elegant and will be attended by a generous number of people. The wedding hotel arranges for your big day’s delicacies and also offers amazing décor. Moreover, the venue is available in different time slots, so you can choose the one that suits for the occasion! Novotel, Mumbai, would be your final choice if you want to host your wedding by the sea. Facing the very famous Juhu beach, the wedding hotel looks through the wonderful seashore! It has multiple banquet areas with varying capacities, so you can choose the one that suits just perfectly with your occasion. Their high class catering service will leave your guests delighted; whereas, the décor team will create the perfect look for your big day. What else? It will make sure that the alcohol served is of fine quality and will spruce up everyone’s mood. Accentuating chandeliers, carpeted floor and gorgeous wall paper is what makes the banquets of Grand Hometel, Mumbai, look unique and beautiful. Ideal to host wedding reception and pre-wedding functions, the wedding hotel has two banquet halls and a terrace that have well-maintained interiors, which will add beauty to the occasion. And it serves exceptionally delicious cuisines that your guests will love. Apart from this, the beautiful hotel also offers two changing rooms on a complimentary basis, so the bride and groom can comfortably change and do the final touch-ups for their big day!